When we started working on what is now IFS Aurena, we wanted to reimagine the design of IFS Applications completely. We started with a blank space and thought about what would allow us to work with new interaction patterns. Any successful business change replies on people being engaged and committed. When a business process is intuitive to use it is embraced quickly, and when it empowers, it engages people in their work. 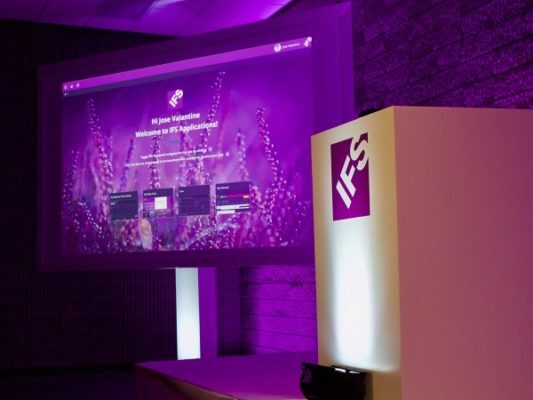 IFS Aurena is not a revolution for the user, for all the innovation in the underlying technology – it’s an evolution of the existing user experience. Everything is user-centric from the moment you log in. The welcome screen shows you the tasks you were working on most recently, as well as giving access to everything else you need. There’s a card-like view that summarises information from records. The search allows powerful filtering to find what you want. The B2B user’s experience is a little different. You can customize the view, with company branding and colors. The B2B user generally only accesses a limited set of functions around a job, so they’ve made the lobby the login page. They can drill into their assignment, go into full screen, and zoom into details. They can access calendars, maps and all the other information they need to action the assignment, in a simple, intuitive form. The goal of building IFS Aurena for IFS Applications 10 was building a consumer-first, cross-platform solution. What they have is a state-of-the-art, responsive solution that works on all devices. And it is truly responsive. This isn’t a mobile-first solution, because there is complex data in IFS systems that requires bigger screens. But it does leverage the unique capabilities of mobile device – like adding photos. Mobile devices are changing our behaviors. Many of us find ourselves consistently switching between devices in our daily work. IFS Aurena supports switching between phones, tablets and desktops, and allow you to start tasks on one device and finish them on another. It fully embraces the change in our working patterns. True responsive sites require serious thought on how each device works. A 15 column list fits perfectly on a desktop. On mobile, you need to either to shrink it down, or choose a subset of data to show. IFS Aurena allows the developer to prioritize which data is shown. We have card views, list views and table views, all of which adapt to the device used. But mobile, again, is a different device with specific needs. The touch view is an answer to that, provide a task-centric view, with swipe actions. And all of these views can be used on the same control. 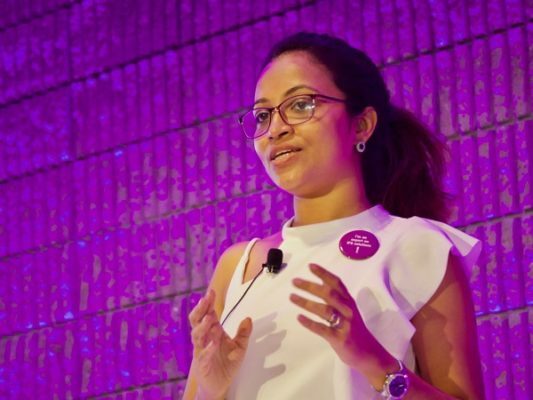 To reach this position, they needed a really big leap in technology: HTML5, oData 4 and Angular js are just some of the underlying technologies they use. There’s a RESTful API, and a declarative language that developers can make use of. The declarative language makes real-time page development possible, without any downtime. Search views can be configured, with options emerging based on data type – single date or date ranges, for example. This makes it much quicker to get pages up and running. Badge color can easily be applied to data, to make the user experience clearer and easier. Bar views allow clear indication of which tasks are a priority. Contact information tools can be added with a tiny piece of code, which allows clickable information cards for people records. Developers do not need to worry about making the controls work – they just need to declare the controls and the responsivity of the system handle the rest. With a little bit of declaration, you can create things, without worrying about where things are going, and micromanaging it in HTML and CSS. Aurena uses the same business logic as IFS Enterprise Explorer, allowing you to use them both in parallel. all features are immediately available across all platforms. IFS Aurena and IFS Explorer will exist in parallel in IFS Applications 10. The rollout will be in waves, with the first wave available now, and the next wave in September. The third and final wave is planned for mid-2019 for early adopters. This is a very high rate of evolution. And don’t worry, existing functionality will continue to be upgraded during this process. IFS Aurena will bring an outstanding user experience for everyone, everywhere.